Bookscouter App Review – Is It Legit? Last updated on February 2, 2019 By Nat Leave a Comment This post may contain affiliate links. We appreciate you supporting Rags To Niches! Full disclosure here. Today, I’m looking into an interesting App called Bookscouter…. But what is Bookscouter.com about and how can this App make you money? My Experience With BookScouter App. Bookscouter – As An Arbitrage Opportunity! Alternative Ways To Make More Money… Long Term! Bookscouter helps people to sell textbooks and used books in general, by finding the best place to sell or buy the book. It helps you to compare offers from 30 different book buyback vendors – including Amazon. Shipping your book to the buyback vendor is free of charge and you may even get paid on the same day that your book is received. Getting Started With The Bookscouter App. You can join Bookscouter via their main website – but with their App, it’s a lot faster and more convenient. That’s because, you’re able to scan books barcodes from the App, which is obviously quicker than adding an IBSN number. I downloaded the App via appstore, (but you can also download via Google play). Getting started is easy, you only need to give your name and email to register. You can immediately start scanning book barcodes and adding these books to a virtual bookshelf. I like this bookshelf feature, as it can help you keep track of the books you have already scanned. 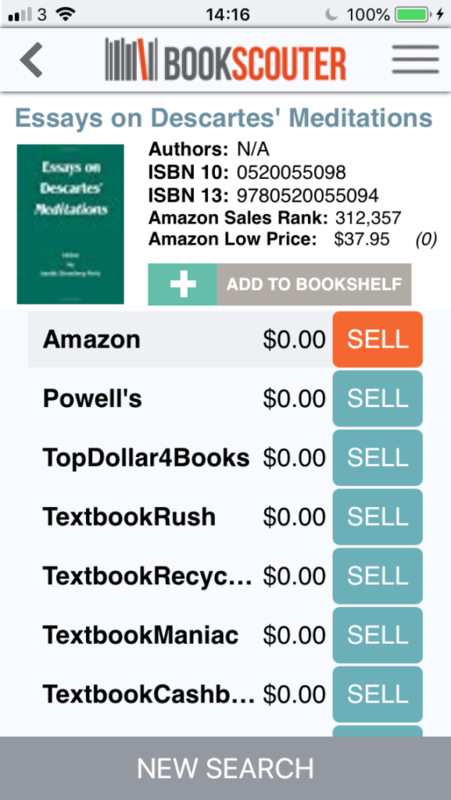 Bookscouter is great for students wanting to sell their used and unwanted text books and wanting to get the best price. But it’s also for anyone just wanting to get rid of their books in bulk, (they don’t have to be textbooks). Finally, you could make extra money buying books at v.low cost and selling them for a profit. By using the App to scan your books, you can see how much you can sell them for, (30 different companies are searched for the best opportunities). Many times, it may not be much! But it really depends on the book so it’s worth a scan. Unfortunately, according to feedback the App will often come back and say your book isn’t going to be worth much – or nothing in some cases. You may have better luck selling your books on Ebay, if they were very expensive to buy. While Bookscouter talks specifically about textbooks, you can scan and search for other books as well. I personally still have tonnes of textbooks from my student days, because they cost so much and I didn’t get around to selling them. However, when I scanned my first book, no price was available to me! The book was recognized and it told me the price of it Amazon, but not a price I could actually sell it for on the platform. After scanning a bunch more, it was the same scenario each time. I also saw that they only showed a price in US dollars. So, although you can download the App from outside the US, it looks as though they only search for look for companies based in the US with this App. If you’re in the UK – I recommend you try Music Magpie. Furthermore, it seems I’m not alone in this experience. Reviewers online have also complained about not getting results for their books. Bookscouter – As An Arbitrage Opportunity!? This is possibly the best way to use Bookscouter in my opinion. You can go to thrift stores, Garage sales and so forth and scan the books there, to see if you can make a profit. Obviously, you may have to be a bit subtle about doing that and many people may not feel comfortable doing so. However, some users have claimed to make a decent chunk of money by doing this. You’d have to make sure you do check out the books before you buy them though, as many books wouldn’t be worth it. I would guess that after a while, you’ll get a good idea about what sort of books can sell well. Bookscouter has an average of 4.1 stars on the App store and also 4 stars on Google Play as well. Although, in both cases, the reviews are in the hundreds rather than the thousands. On the downside, some people complain of the App being buggy or glitchy. I personally didn’t find this at all, but it is something people have complained about. Another downside is that, many books will not pay you very much at all… But, this is really to be expected! So, if you’re looking to buy or sell books for a profit, you’ll have to gradually learn over time the sort of books that will bring in the best profit for you. Free easy to use App. Scan books and quickly find a seller. Searches over 30 sellers online. Paid quickly once books are received. Low pay for most books. Many books you may be unable to sell, ($0 on offer). Bookscouter is not a scam – this is a legitimate business and App, that can help you to buy or sell your used books for profit. It can also potentially help you earn money selling books on the side and generating a bit of an extra income. Ultimately, if you have some books to sell, the App is easy & quick to download and it takes seconds to scan your book – so, check it out and see. Alternative Ways To Make Money – Long Term. Buying and selling used books has been a long established money-making opportunity. Particularly online, with the likes of Ebay and Amazon and there are still people making money on these platforms. If you’re interested in how to get started with that – this post from “Jungle Scout,” has some good tips for getting started with Amazon. However, there are tonnes of different ways that you could start making money online and I outlined 40+ ways right here. Personally, I primarily make money online, with my website…. How? Mainly from affiliate marketing and paid advertising. I knew absolutely zero about anything like this when I first started out, but this place helped me get started*. I hope you found my Bookscouter review helpful! If you have any questions, feel free to leave a comment below!